Since I ordered wrongly the previous time I was at Sweet Bean, I ate there again and made sure I ordered the right food this time. Two of us shared all the food below. 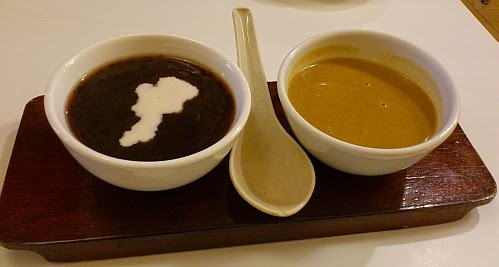 A set of mini bowls "tong sui" (sweet soup) - MYR4.20 - black glutinous rice and peanut paste (correctly ordered peanut paste this time). Nasi Minyak (Oil rice) - MYR7.90 - but looks like Nasi Lemak to me except that the rice is not cooked with santan (coconut milk) but with minyak (oil). 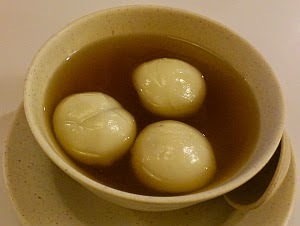 My spouse wanted something hot so ordered this extra bowl of hot ginger sweet soup with sesame glutinous rice balls. The ginger taste is very strong and really "heat" up our stomachs. Total bill came to MYR18.25 after MYR1.66 (service charge 10%) and I paid MYR20 but only got back MYR1.70 so I asked the cashier, don't you have a 5 cent coin? Then only she returned me a 5 cent coin without saying anything. So I guess in order to get back the correct change, I need to ask. The previous time I did not ask and so I was short changed 5 cents. What food goes with the sweet desserts in your opinion? whether o not ordered wrongly or correctly, the tong sui still looks nice and delicious to me! as for the change in the bill, nowadays alot of seller disregard the 5cent, even in some established food chain. Some even worse, 10cent also they keep to themselves! i totally blacklist a particular kopitiam coz firstly i m sure they have 10 cent, secondly the person who return the coins is the lady boss summore, either she tinks i m a bimbo or she is a bimbo herself! and btw it isn't some nice air-cond eatery, it is some chinese coffeeshop selling wantan mee. Did you ask the lady boss to give you the correct change before? If yes, did she refuse? Mini bowls? But it looks like a big bowl.. Love peanut paste.. But cannot always eat la, heaty.. 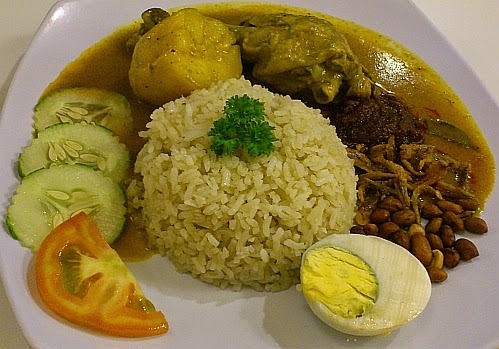 I like 'yau farn' (nasi minyak) too, looks good.. It is much smaller than normal bowls. That place is in the area where we usually go for dinner. The mini bowls look so nice in a pair like that! Ya la nasi minyak doesn't look quite right... shouldn't have peanuts/ikan bilis nor egg. Normally nasi minyak is for steamed chicken. I would associate nasi minyak with ayam masak merah, acar and a papadum... heh. Thanks for telling me. I did not know ayam masak merah is served with nasi minyak normally. Actually I am one of those customers who disregard 5 cents. Not to the point of refusing the change lah, but sometimes when the cashier "jing sik jing sui" when fumbling for 5 cents, I will tell them not to bother... If in McD, I will drop the 5 cents into the donation box..
Like contact.ewew said below, it is the principle. They as a business must give the correct change and later if we want to give as tips then it is ok. They look like very interesting soups. I think I'd like to try the peanut one. Have you eaten these peanut or sesame sweet paste before? Shortchanged 5 cents...I have had that happened to me numerous times too. Although the sum is negligible, I would ask for it too coz it's the principle that counts (of giving the right change). If they don't have the 5 cent coins, they should give us back 10 cents...more not less! I love sweet stuff in ginger soup too. I agree that it is the principle, not whether 5cents is a lot or not. We both have a sweet tooth! Because of the ikan bilis and peanuts.